A body fixed about a axis and moving around it can be treated as rotational motion. We would like to solve some problems on this topic. We cannot apply rules of translatory motion on this case and we need different set of physical quantities as well as rules to understand the rotation of a body. Instead of each physical quantity of translatory motion, we need to identify a proper physical quantity and we also need to find the relation between them. Axis of rotation is a line about which all particles of the body are rotating. It is given in the problem that a wheel is starting from the state of rest and is having a constant angular acceleration of known value. If how much angle is covered in a specified time, we need to find for how much time the wheel is under rotation. Problem is as shown in the diagram below. 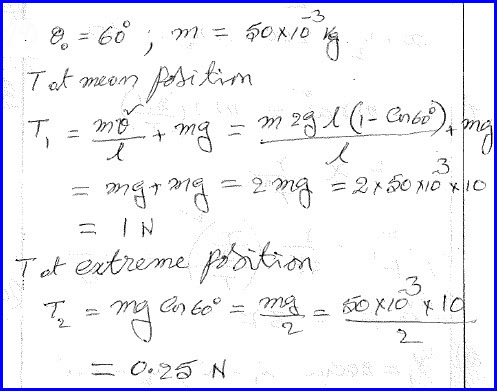 We can write similar equations of rotational motion in comparison with rotational motion. Instead of displacement we have angular displacement and instead of acceleration, we have angular acceleration. By applying the rules similar to translatory motion and further simplifying the equations, we can solve the problem as shown in the diagram below. 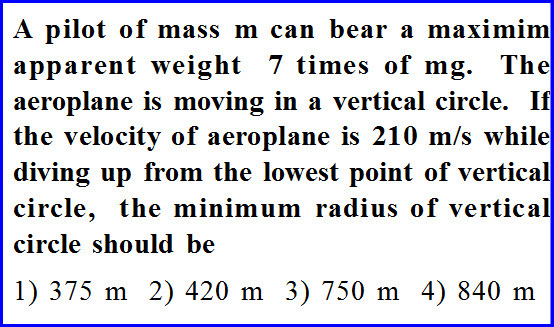 A pilot of mass m can bear a maximum apparent weight seven times of its weight. The aeroplane is in vertical circular motion. If the velocity of the system at the lowest point is given to us, we need to measure the minimum radius of the vertical circular motion. Problem is as shown in the diagram below. We know that when the body is at the bottom of the vertical circular motion, its weight is acting in the downward direction and the tension in the string is towards the center. Being in circular motion, there shall be centripetal force and it is the effective force acting towards the center of the circle. Thus it is the difference between tension in the wire and weight of the body. 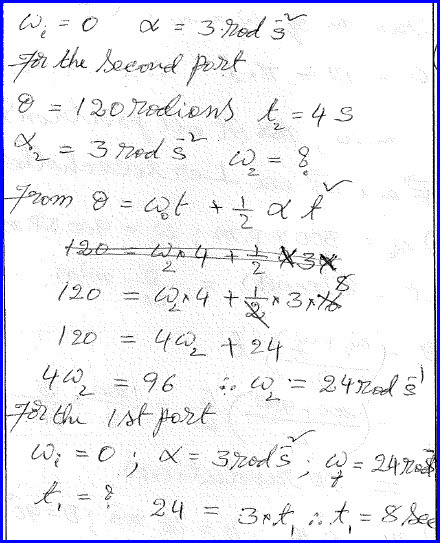 As the tension maximum possible is given in the problem, it can be substituted in the given equation as shown in the diagram below and solve the problem as shown. 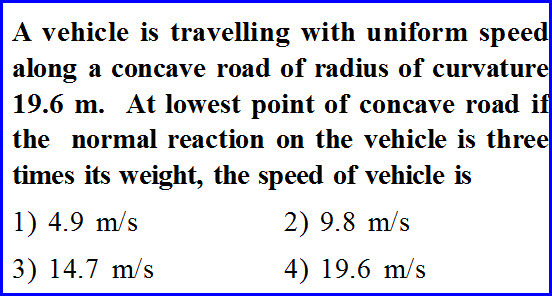 A vehicle is moving with uniform speed along a road with concave shape and its speed is given to us. If normal reaction at its lowest point is three times of the weight, we need to find the speed of the vehicle and the problem is as shown in the diagram below. 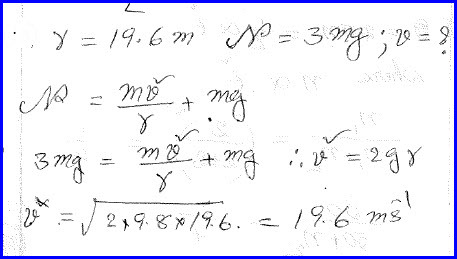 Radius of the circle is given to us and we also know that the maximum normal reaction is three times of the weight of the system. By writing the equation for centripetal force as the effective force acting towards the center and simplifying the given data, we can solve the problem as shown in the diagram below. 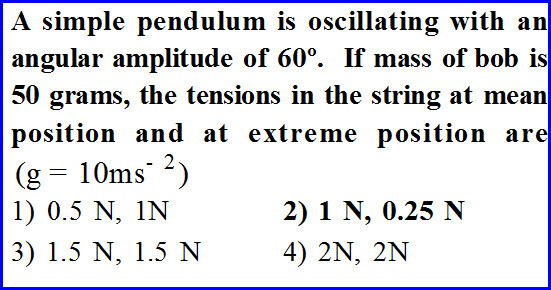 It is given in the problem that a simple pendulum is oscillating with a angular amplitude and mass of the bob is given to us.We need to measure the tension in the string at its mean position and extreme position and the problem is as shown in the diagram below. 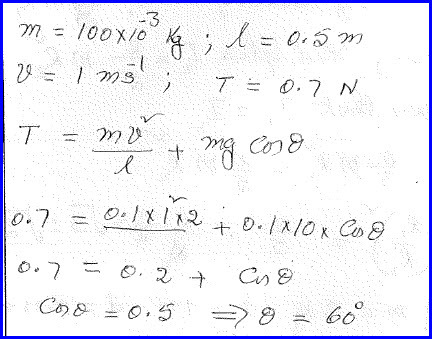 We can write equation for the centripetal force as a effective force of a body in circular motion. We can solve the data at any point basing on this data as shown in the diagram below. 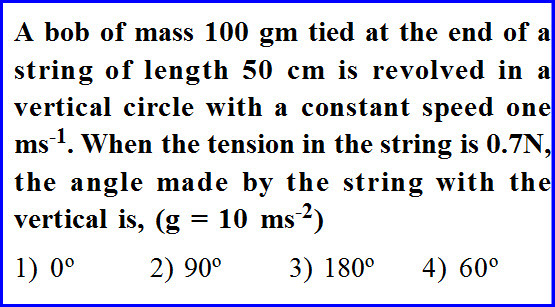 A bob of 100 gram mass is tied to the end of a string of length 50 centimeter and is revolved in a vertical circular motion with a constant speed. If tension at a point is given to us, we need to know the angular position and the problem is as shown in the diagram below. 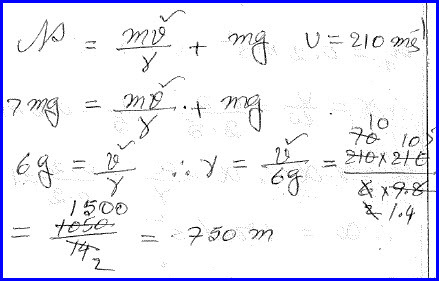 We can write the equation for the tension at a given point of vertical circular motion and the problem can be simply solved by applying the data given in the problem as shown in the diagram below.